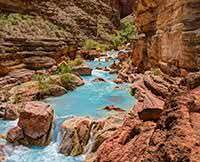 I left my heart in the Grand Canyon! 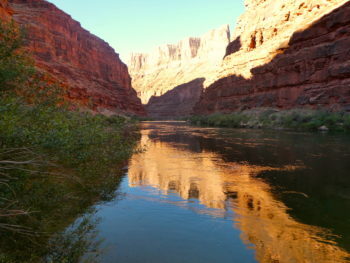 My son persisted for several years in convincing me to take this Colorado River trip with him. Am I ever glad he did. It was a truly transformative experience for both of us to be outdoors and off the grid for a week in the staggering splendor of the Grand Canyon. After a day of getting acclimated we quickly surrendered to the unique rhythms and sensations this cathedral of the earth revealed to us. This was made all the more enjoyable by the great folks in our group and the wonderful, highly experienced crew who accompanied us. Our group consisted of 28 people from diverse locations, backgrounds, and ages, all of whom blended very nicely in various settings: on the river, in camp having dinner together, and on the various hikes. Our guides: Wiley, Evan, Kiefer, and Emily were top notch in every way, making sure our experience was memorable as well as safe. Many things impressed me: their knowledge of the canyon's geology, history, and natural environment; expertise at navigating the river and rapids; friendship and openness; and being great cooks. Reflecting back, I realize that an even more elemental reason for the richness of our experience was their skill in setting boundaries for us, and then giving us the freedom and personal responsibility to fully explore our environment. It's interesting that as I was writing this note, my son called me to say that feels like a piece of him is still back there. That's exactly how I feel, too. Words and pictures are great, but if you want the full impact of a vacation with true and lasting meaning, then take this one.